OnePlus has had a great success with their recently launched OnePlus 6. The phone is truly a flagship killer and has sold more than a million units worldwide in a span of a few weeks. Upon launch, OnePlus had also revealed a limited edition variant of the device, called the OnePlus 6 Avengers Edition. The Avengers Edition featured a glass back panel with a carbon fibre design underneath. It also came with Gold accents, the Avengers logo, and a gold colour alert switch. After that, OnePlus announced the OnePlus 6 Red variant, which also looks really good. The red isn’t too bright, or too mellow. It’s just the right amount of Red. And now, you can buy the OnePlus 6 Red in India. The OnePlus 6 Red is now available for purchase exclusively via Amazon India and the OnePlus online store. The Red variant comes with 8GB of RAM and 128GB of internal storage. 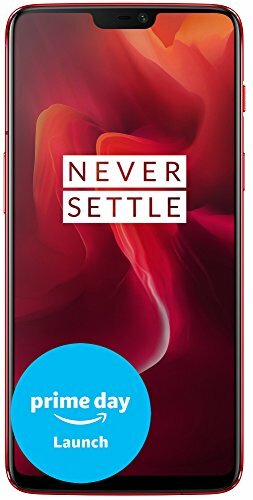 OnePlus has priced this device at Rs. 39,999 in the country. If you are interested in purchasing the phone but don’t want to do it online, then the phones can be purchased in a few of the OnePlus offline stores as well. Contact your nearest OnePlus dealer for more information. The company has gone into some detail telling us how they made the Red variant of the OnePlus 6. It uses a special optical coating process, a unique evaporative film, and a total of six glass panels along with another anti-reflective panel to provide maximum reflection. This reflective layer allows more light to get to the bottom layers of the glass, which in turn creates a sense of depth. These are the exact words of OnePlus. One of the glass panels is translucent orange, which mixes with the red layers to create a very different red. Apart from being all red and glossy, the OnePlus 6 Red also features gold accents similar to the OnePlus 6 Avengers Edition. The fingerprint sensor and the camera hub get the gold accents. The Aluminium frame around the phone also matches perfectly with the Red of the phone. Although the Red is very striking, it is still a marketing ploy to help the company increase sales. Everyone does this, even Apple, Samsung, and other players. So when you release a new colour, obviously people will talk about it, and that helps the sales. You already know what the OnePlus 6 has to offer. But in case you have forgotten, then here’s a brief overview of the flagship killer. The phone comes with the latest hardware available in the Android market. It gets the Snapdragon 845 processor, up to 8GB of RAM, and 256GB of internal storage. Only the Avengers Edition and Midnight Black variants of the OnePlus are available in this configuration. OnePlus has installed a large 6.28-inch AMOLED display on the phone, which has a 19:9 aspect ratio and a Full HD+ resolution. The phone is all protected by the latest Gorilla Glass 5. In the camera department, the phone gets a dual-camera setup with a primary 16MP Sony sensor and another 20MP Sony sensor. The main 16MP camera has both OIS and EIS, can shoot 4K videos at 60fps, and Super Slow Motion videos as well. The front camera has a resolution of 16MP and also feature EIS. The OnePlus 6 Red also comes with Bluetooth 5.0 LE, NFC, GPS, GLONASS, a USB Type-C port, 4G VoLTE, and a 3300mAh battery. The phone supports fast charging as well. You also get Face Unlock, a fingerprint sensor at the back, Dirac HD sound, water resistance, and it runs on Android 8.1 Oreo-based Oxygen OS.